09.01.2005 - How to Solve an Armadillo Problem? Well, first of all, identify the exact problem. Is the animal digging up the yard? The flower beds? Has it made a large burrow next to the house? Is it living under the porch? Is it driving your dogs wild at night? Now that you've got the problem identified, you can pursue an exact armadillo control strategy tailored to the individual needs and nuances of the circumstance. So for example, if the problem is digging in the yard or flower bed, I recommend trapping and removal to solve your armadillo problem. If it's burrowed next to the house, I recommend trapping and removal to solve your armadillo problem. If it's keeping you or your dogs awake at night, I recommend trapping and removal to solve your armadillo problem. Hmm? seems that there's only one solution for the vast majority of armadillo problems - trapping and removal. You see, there's no real good way to simply keep armadillos away. There's no deterrent spray or repellent powder that will do the trick. No ultrasonic sound machine will keep them at bay. Physical barriers are often good, but then again, armadillos will often just dig around them. So usually, the best way to solve the problem is to remove the offending critter from the area altogether. What Are The Most Important Facts About Armadillos - People who find that they have an armadillo problem where there is damage being caused to their yard or garden will often want to act immediately, but there is one thing that is worth considering before taking action. Armadillos can be a real problem in many areas, but because they are not native species many states have strict and direct regulations about what can be done with such animals. Because of this, everyone should check what the situation is in their state before laying out traps or trying to kill the animal in case they are actually breaking the law. The fact that armadillos are originally from South America and have migrated northwards into the south eastern states of the USA means that there are very few natural predators for these hard-shelled creatures. There are other important things to consider when dealing with an armadillo problem, but it is their legal status that will be the most important thing for people looking to avoid falling foul of the law. This means that many people would be advised to hire a professional pest control company rather than trying to deal with the problem themselves, who will be familiar with the local laws relating to armadillos. 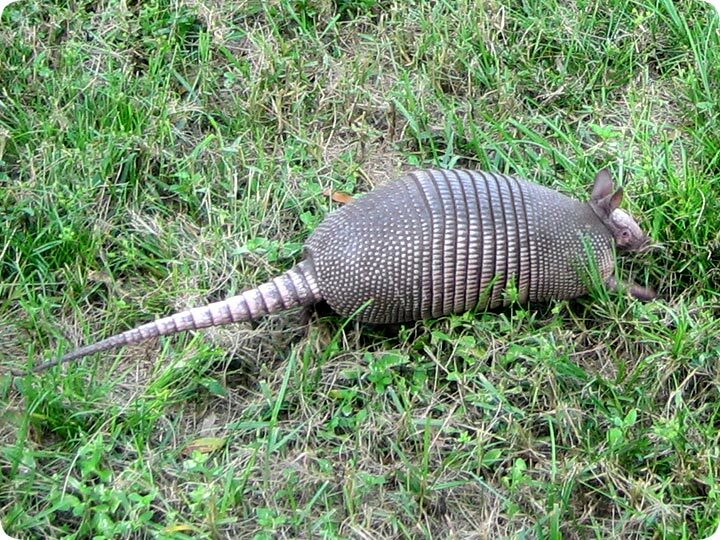 Do People Try To Kill Armadillos To Solve the Problem? There are many different methods that people can use when they try to get rid of armadillos, and many people will actually want to kill these animals to get rid of them once and for all. One method to kill these armadillos is to use a snare trap, but the problem with this method is that it is difficult to master. Another option that some people will use is to shoot the animals with a rifle, but because they are nocturnal animals and can often take quite some time to spot, this is often an impractical option for many people. There are also some homemade solutions that people can try to kill an armadillo, such as putting out a shallow bowl of antifreeze for the armadillo will drink. The main problem with this, and all of the methods that people can use to try ti kill armadillos, is that there's no way ever get a dillo to eat the poison! They only eat live bugs that they dig out of the ground. Another general problem is that it is difficult to ensure that no other animals are harmed. It is also difficult to ensure that the animal doesn?t crawl away to die elsewhere, and especially if it lives in a cavity near the house the carcass can become a health hazard that also has a noticeable smell that will often be scented in the house.